I am a huge lover of salads. I could eat them everyday. Probably why I have so many salad recipes on my blog. 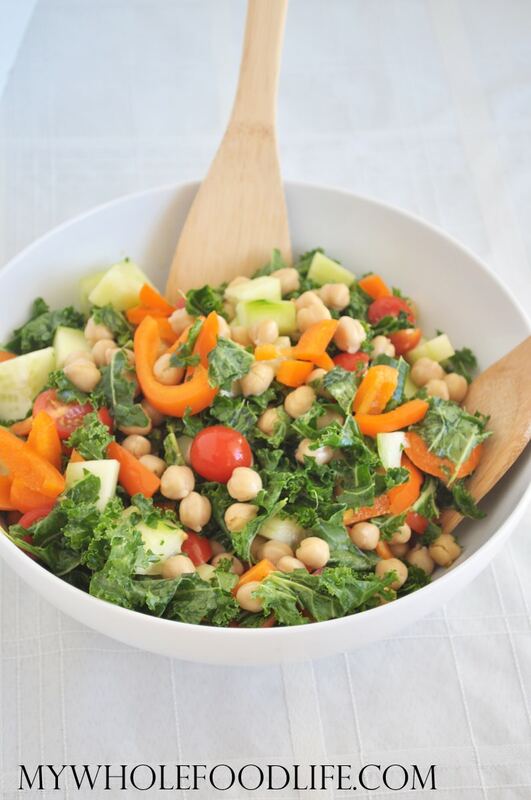 The latest is this Balsamic Kale Chickpea Salad. It has all my favorite flavors in one yummy salad recipe! It takes no time at all to throw together. This salad would be great for parties. It’s vegan and gluten free. Super healthy and tasty. This recipe calls for removing the stems from the kale. Don’t throw them away. You can save them for juicing or homemade vegetable broth. I massaged the kale, so it’s much easier to eat. I filmed a video about massaging kale if you want to check it out below. For more videos, check out my You Tube Channel. A healthy salad perfect for parties! Put all the salad ingredients in a bowl. Pour dressing over the salad and toss well. This salad should keep for at least 5 days in the fridge. Enjoy! Do you use the WHOLE recipe of balsamic dressing? No. Just as much as I needed. :) The dressing recipe will keep in the fridge for several weeks. I also kept the dressing and salad separate so the salad would last the week in the fridge.